Before there was Indiana Jones, there was Robert Ripley. Believe it or not, there might not even be an Indy if not for Ripley, a real-world cartoonist and explorer who travelled the world in the 1930s to report incredible feats on his radio show and collect unique antiquities for his Odditorium museums. 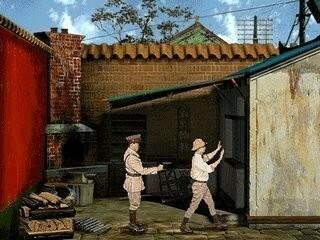 The whip- and fedora-clad one may be better known today, even in adventure gaming circles, but Sanctuary Woods’ 1995 Ripley's Believe it or Not! : The Riddle of Master Lu gave the bow-tied, pith-helmeted hero his own chance to shine, and he didn’t disappoint. Although based on the real man, Ripley’s interactive adventure is entirely fictional, sending him around the world in pursuit of information about the tomb of the First Emperor of China, which was built and protected with traps by the ingenious architect Master Lu. Ripley’s not the only one seeking the tomb, however, as it’s said to house the legendary Imperial Seal, an emerald that can bestow mystical powers on whomever possesses it. With enemies ever nipping at his heels, along the way Ripley must also gather oddities to send back home to keep his ailing American museum afloat. Your travels take you to such exotic locations as China, India, Peru, and Easter Island, which can be visited in any order, even coming and going as you please. Blending live-action characters and nicely pre-rendered backgrounds, each scene is jam-packed with detailed hotspot descriptions, many of them purely optional. The non-linearity and high degree of interactivity make this a fairly difficult game, and there’s some pixel hunting involved in overcoming the many inventory obstacles. Puzzles are cleverly integrated, however, including three timed challenges, such as rescuing Ripley’s friend Feng Li from a king cobra. You can die in this game, as befits the sometimes deadly nature of the opposition, but an auto-save wisely restores to a point just before your demise to try again. All told, The Riddle of Master Lu is a game with everything: diverse locations, engaging characters, and substantial gameplay. But don’t take our word for it: playing is believing. Suicide... Sexuality... Child slavery... Abuse... These aren’t your normal adventure game themes. Then again, Arxel Tribe’s Faust (or Seven Games of the Soul in North America) is anything but your normal adventure game. Exploring many mature, complex psychological themes, the game is loosely based on the 19th century poem by Goethe about a man who sold his soul to the devil. Here Marcellus Faust, an elderly black man, arrives at an abandoned amusement park called Dreamland, where a suave demon named Mephisto tasks him with helping settle a dispute with God. By travelling back in time through seven overlapping episodes, you must investigate the troubled lives of Dreamland’s bizarre inhabitants through their eyes to determine the fate of their souls and unravel the macabre history of the park. From the freakshow exhibits like the Siamese sisters and 550-pound woman to employees like the costume seamstress and tiger tamer, each harbours dark and painful secrets, and it’s up to you to find material evidence that will either implicate or absolve them of complicity with the devil. Sound deep? It is, and its relentlessly disturbing focus on the seven deadly sins is only scratching the surface. The fragmented storyline is intrinsically multi-layered, offering mystery within mystery, puzzle within puzzle, and subplot within plot as each carnie’s intertwining history slowly weaves together to form a larger picture. The gameplay can be as challenging as the narrative, making this a true thinking gamer's adventure in every respect. The artwork is merely average, but musically the game is a triumph, with a wonderful blend of old jazz, blues, and classical vocals and instrumentals alike, and Mephisto is perfectly voiced as the debonair tempter who genuinely believes in his cause. The bulk of the game is spent raising more questions than it answers, which is what makes it partly intriguing, partly frustrating, but exploring the complexities of the human soul and the ambiguities of good and evil are what give the game its value. It is easily one of the more original adventures available, so play it for yourself if you won't take our word for it, oh ye of little faith. It may well be remembered as one of the straws that broke the back of the genre's Golden Age, but the commercial failure of Toonstruck has unfairly followed the game around for too long. 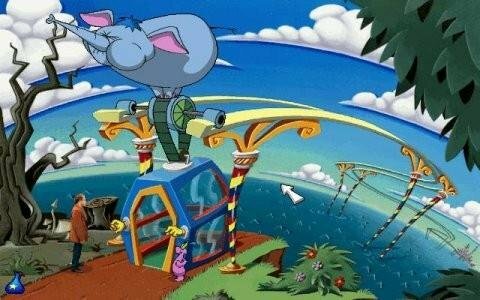 Burst’s 1996 adventure features Christopher Lloyd as a depressed cartoonist who finds himself sucked into the cartoon world he created. The game, unfortunately, could never recoup its huge budget, but it deserves to be admired on its own merits, not its retail failings. The production values from film industry professionals are incredibly high, displaying quality drawings and animation, and there’s a huge cast of famous voice actors, including Dan Castellaneta of Homer Simpson fame. Compared to other titles at the time, the graphics were top-notch, and sound production was way above the average – no expenses were spared, whether that was a wise move or not. Although the game makes use of a live-action protagonist inserted into an animated world – an obvious stylistic clash – the writing is so good that you really feel like you have entered a Looney Tunes cartoon, where bizarre logic rules and you have to be aware of comic conventions to solve some of the complex puzzles. The adventure is substantial, too. You complete your main objective halfway through the game, only for the plot to skew off in another direction and unlock a whole new series of locations and characters to find. The story, which plays on the stereotypes created by popular cartoons, is genuinely funny and cleverly combines the sarcastic wit of Lloyd's Drew Blanc (an outsider looking in) with the wacky sense of humour of the toons. The balancing act it walks is very fine, but the script manages to take knowing pot-shots at its influences while still paying homage to the medium that inspired it. A sequel was planned, but the numbers just never added up, leaving only this final reminder of a time when Hollywood, big budgets, and adventure games were once a reality. 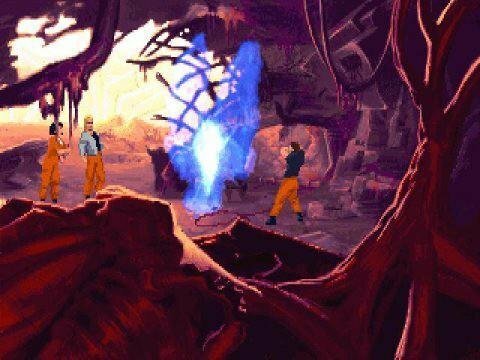 The Dig is often regarded as the runt of the LucasArts litter, never quite resonating the same way as its more famous brethren. Perhaps that’s because it’s a purely dramatic sci-fi adventure and people didn’t know what to make of it back in 1995. 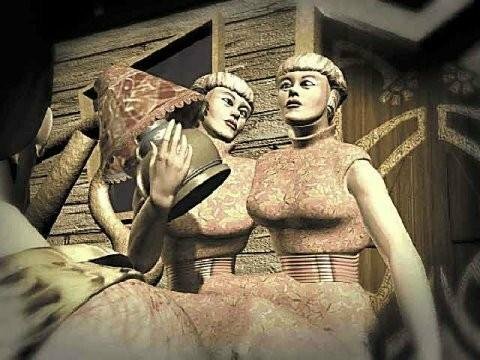 And while it’s a traditional point-and-click adventure similar to its comic contemporaries, the game’s puzzle design has more in common with the likes of Myst than any of LucasArts’ other franchises – something that didn’t sit well with all players. Strip away the preconceptions, however, and what’s left is a very good game in its own right, with a mature storyline based on an idea by Steven Spielberg and written by author Orson Scott Card, boasting a stellar production crew with contributions from Industrial Light & Magic. The story focuses on a group of astronauts tasked with destroying an asteroid, only to be helplessly transported to an alien world in the process. It’s a serious affair that should appeal to sci-fi aficionados thanks to its otherworldly setting and excellent soundtrack, and it wisely (if unexpectedly) avoids any attempts at the developer’s trademark humour. Given its pedigree, it’s no surprise the CGI is flawless, and while the puzzle design is markedly different from the usual zany inventory fare, there are plenty who embrace such mysterious conundrums with open arms. It may never measure up to the widespread appeal of its comedic LucasArts counterparts, but it’s a compelling standalone adventure and a great addition to any serious gamer’s collection. Hell hath no fury like the puzzle designers of The Feeble Files. This offbeat sci-fi adventure should have come with a warning about possible injuries from fist/screen incidents when it was released by AdventureSoft back in 1997. Whether that’s a good thing is for you to decide. Following hot on the heels of Simon the Sorcerer II, this game introduced us to a whole new world of memorable characters. Headlining the case was Feeble, the titular mild-mannered alien lovingly voiced by Red Dwarf’s Robert Llewelyn, who unwittingly embroils himself in corporate espionage and anti-governmental shenanigans after a bad day at the office. 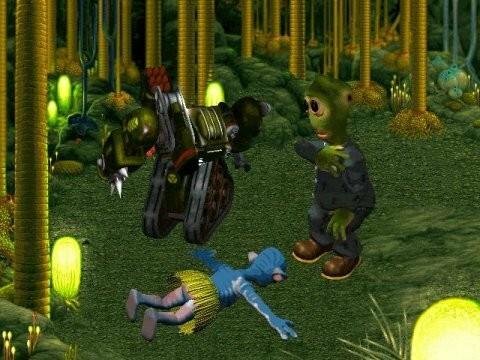 An eclectic, entirely non-human cast was a novel take on the point-and-click adventure, and the game represented a step forward in presentation for the acclaimed British developer, while still managing to carry over the humour from the Simon series. The Feeble Files is a treat for the eyes and ears. Its brilliant mix of pre-rendered backdrops and animated characters look great, it's skillfully acted by some stand-up British comedy talent, and Feeble proves to be a lovable loser-turned-hero that is easy to embrace. However, to truly enjoy this game you’ll need a masochistic bent, as the puzzles have few rivals in their difficulty. They vary from obscure inventory-based tasks to outright horrific minigames and math problems. The Arcade section in particular was so cruel it forced AdventureSoft to release a save file set right after the event so some players could carry on the story. For those who lament the loss of complex, challenging puzzles in the genre, it’s a dream come true. For everyone else… well, there’s always a walkthrough. It’s absolutely worth it, but you’ve been warned. Enjoy immensely at your peril.